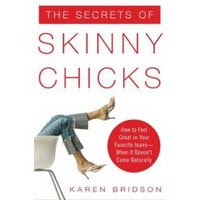 Title: "The Secrets of Skinny Chicks: How to Feel Great in Your Favorite Jeans When It Doesn't Come Naturally"
I recently read a book called "The Secrets of Skinny Chicks: How to Feel Great in Your Favorite Jeans When It Doesn't Come Naturally" by Karen Bridson. I got it out of the library thinking it would be a book about Intuitive Eating -- on the back, it talked of waiting for hunger, and eating just 'til satisfied. And, sure enough, there were many instances where the women profiled talked of only eating when hungry, and stopping just at satisfied. There was also almost a full chapter that talked of "mindful eating" (same thing as Intuitive Eating -- listening to your body's cues). And, I loved the parts where the author talked about loving your body for its uniqueness, and about loving yourself for YOU. She talked quite a bit about overcoming Emotional eating, too. ** This is STILL a "diet" book! Do not read it with the intention of a "quick fix"! No diet is going to work for you forever... they just don't.